Gift to my wife. It is great candle and we all enjoy on the patio. It gives off a lot of light when all wicks are lit! I love this candle. The smell is wonderful also. Great. Great candle. Going to order another !! Enjoyed it and the bowl afterwards, but it did not last very long, especially for the price paid. 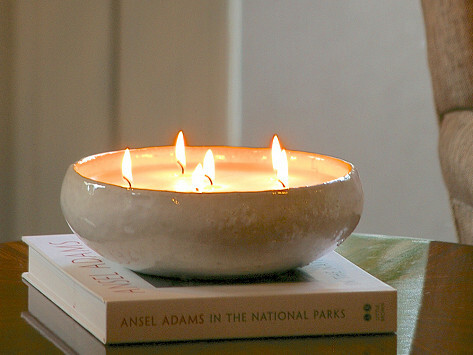 As far as candles go this was reasonably priced and the bowl is very nice. I have been burning mine all day. My candle is supposed to be scented, but haven't smelled anything yet. That's my only downside for this candle. My wife opened the candle today, for Xmas. We are puzzled by what appears to be a coating of plastic around all of the glazing. At first, it seemed to be just part of the wrapping, but it seems to be very difficult, if not impossible to remove all of this coating. Lighting the candle would melt and vaporize the plastic. What is this coating? Pleased with the fill of one, but not the other. I bought two 9" candles in gold. One is taller than the other by over 1/4". They both have approximately the same amount of wax in them. However, the larger one looks like it needs a lot more wax. I like them, but I am also disappointed. If I had ordered only one and received the the shorter candle, I would be happy, as it looks like it has the right amount of wax in the container. I purchased two of these and when removing the clear plastic covering from the candles, the ceramic lip broke off in different places. It is really disappointing to spend so much on a candle and have it break. It's also embarrassing to give something as a gift that you think is a really special present and have it appear to be cheaply made. There’s nothing ordinary about a FlashPoint candle. Instead of one wick, FlashPoint candles have multiple wicks. Instead of identical, bland containers, each candle is hand-poured in a stunning ceramic vessel. The founder of the company, Drea Groeschel, set out to create candles that do more than simply give light and freshen the air in your home. Using multiple wicks creates a dynamic landscape of candlelight—it’s like the difference between a single star and a canopy of stars. Drea specifies the proportions of the drip-glazed ceramic pottery to maximize the effect, and she uses blue-hued glazes on the inside surfaces to reflect the shimmering lights.